What do you do get when you arrange your tortillas, filling, and green enchilada sauce in layers instead of rolling them up? It’s something that I call delicious. We also call it Enchi-sagna. Enchi-sagna is Patty Cake’s short hand for Enchilada Lasagna. 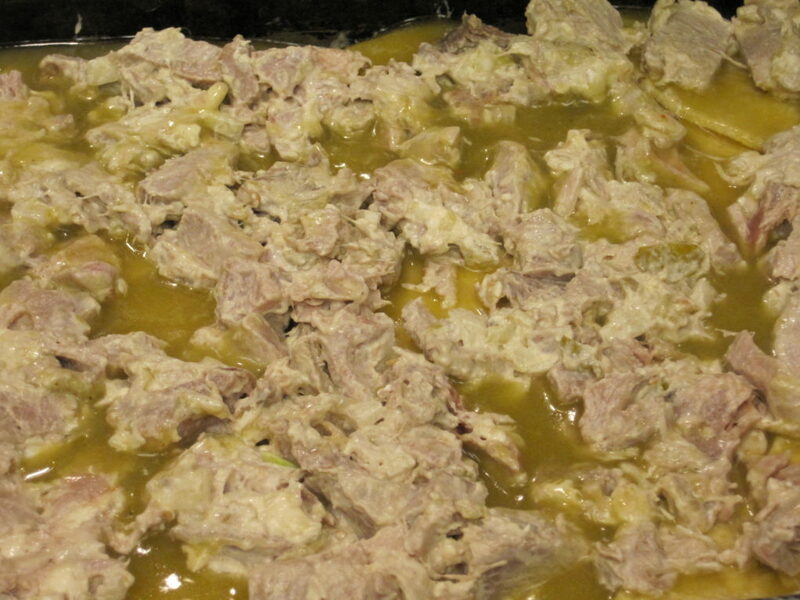 The best reason for making our Green Chili Enchi-sagna this way is that it takes much less time that rolling enchiladas and placing them into a pan. That helps get dinner on the table faster on those busy evenings, and since you don’t have to roll them up, it doesn’t matter if your tortillas are a little bit stale. We know we could’ve called this an enchilada casserole, but where’s the fun in that? 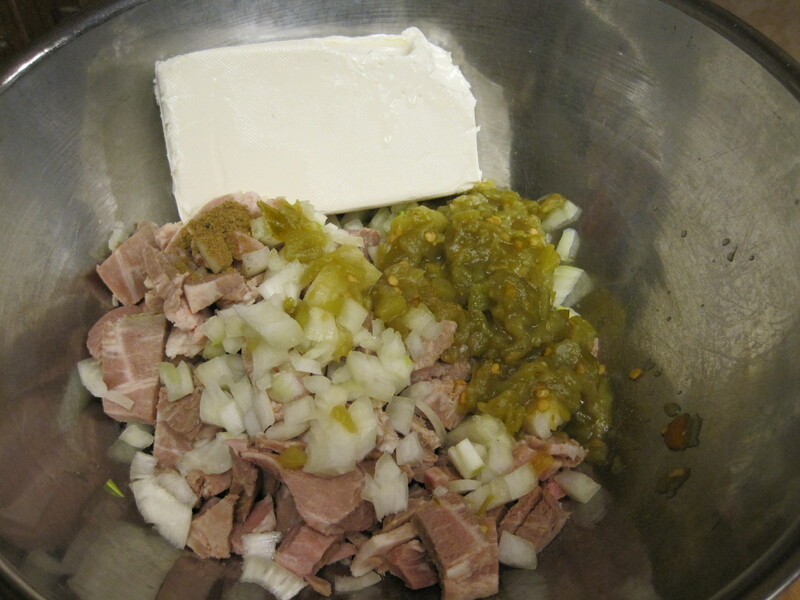 You will need some leftover pork roast that’s been chopped, a chopped onion, a can of diced green chilies (or diced jalapeno if you like it hot), and a block of cream cheese. These are mixed together until everything is well incorporated. Set the mixture aside and cut the tortillas in half. Pour about 1/2 cup of enchilada sauce into the bottom of a 9X13 inch pan. Arrange six of the tortillas (12 halves) on the bottom of the pan, slightly overlapping. 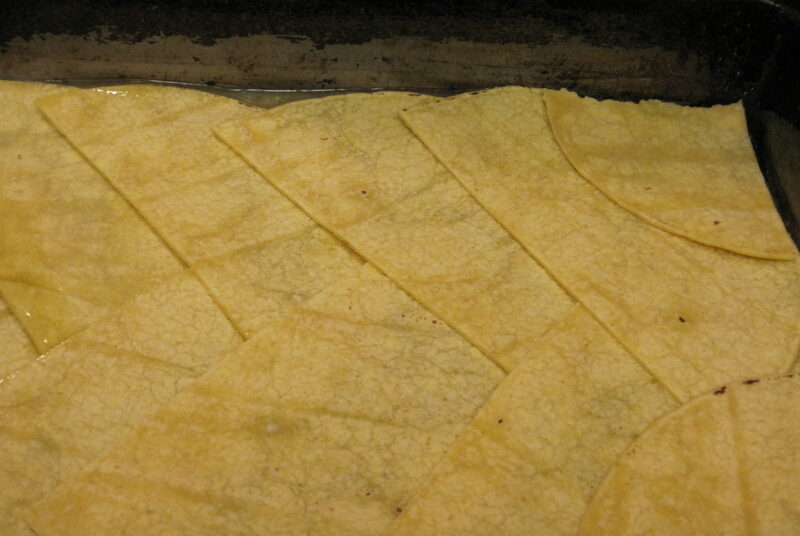 You will need to tear one tortilla half into two pieces to fit into the corners at the final end. 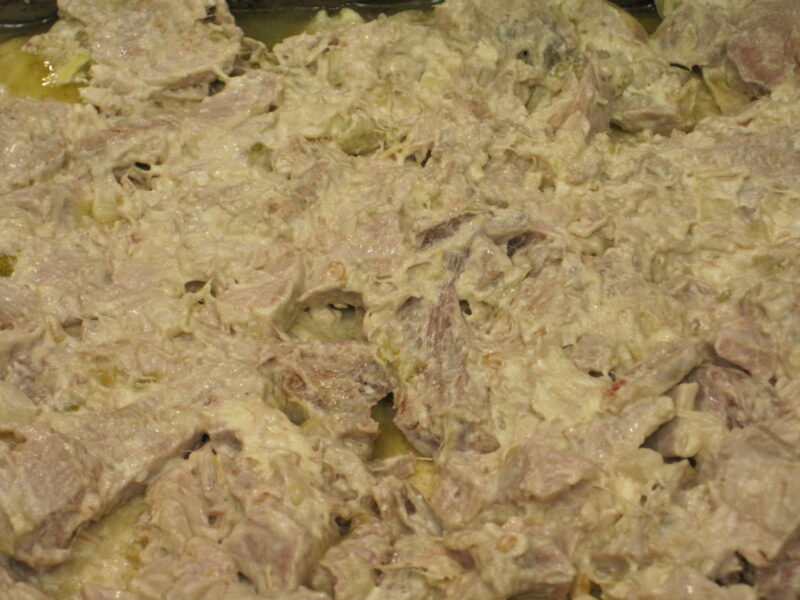 Spread half of the pork and cream cheese mixture on top of the layer of tortillas. Top this with another layer of tortillas and about 1 cup of the enchilada sauce. Put the remaining pork and cream cheese mixture on top of this. Add another layer of tortillas and the rest of the enchilada sauce on top of the ingredients in the pan. 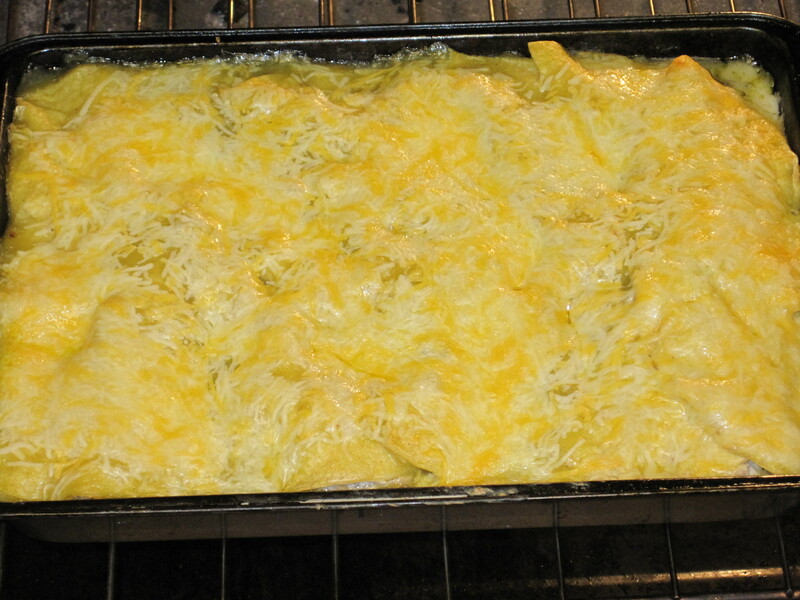 Sprinkle shredded cheese to the top before putting the whole thing into the oven. 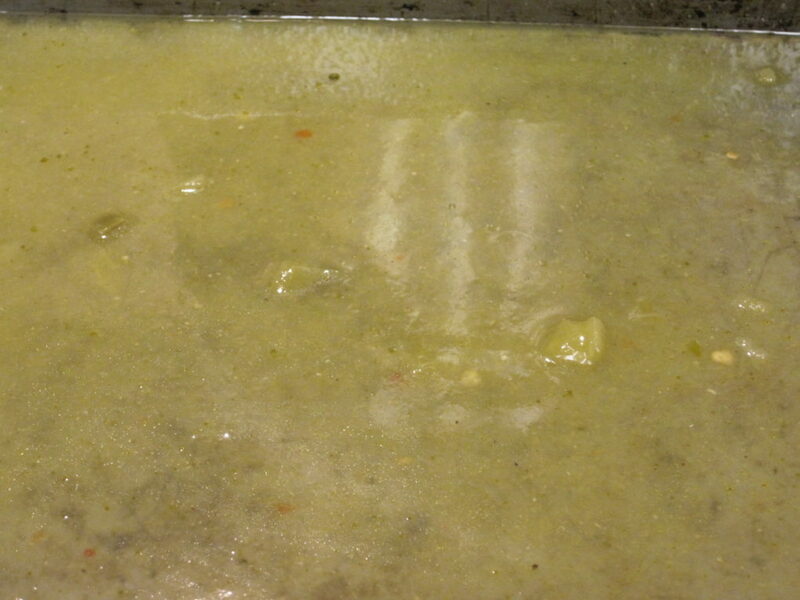 Twenty minutes later, you will find yourself with a pan of bubbly delicious Green Chili Enchi-sagna. Top the Enchi-sagna casserole with a sprinkling of sliced green onions, and return it to the oven for an additional 5 minutes. 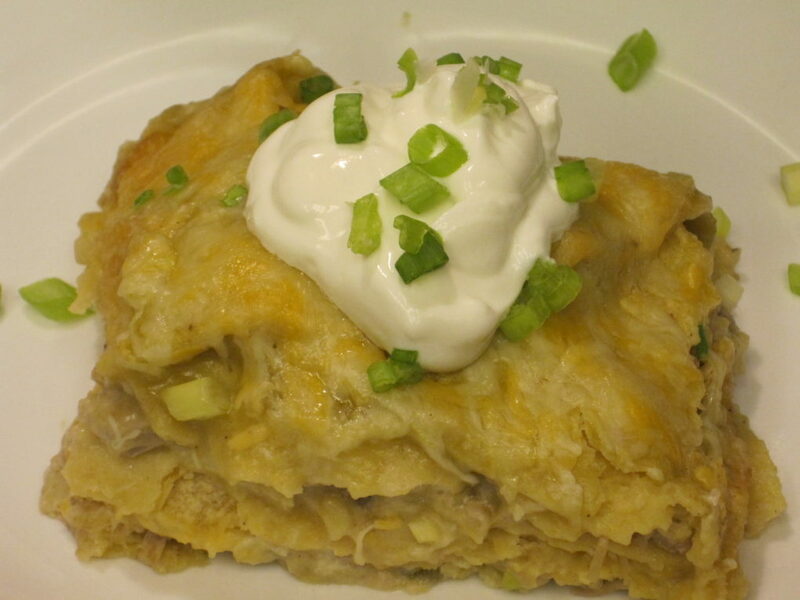 When you remove it from the oven, allow it to stand for five to ten minutes to allow it to cool slightly before cutting it into squares and serving If desired, you can top individual servings with sour cream and additional green onions. This goes great with Spanish rice or a vegetable medley. If you aren’t a fan of pork, this recipe works equally well with chicken. 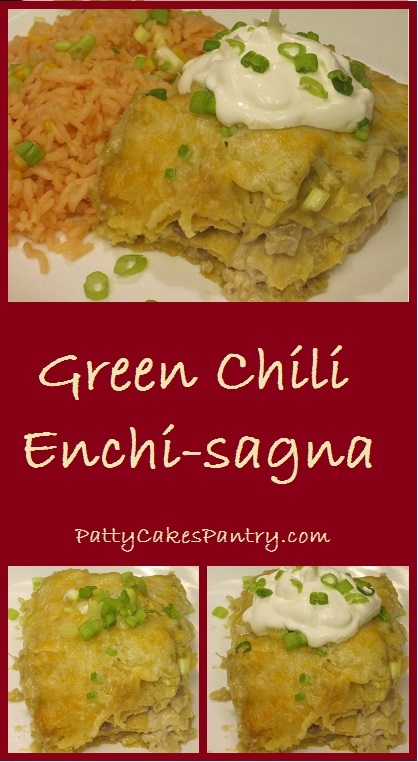 Give our recipe for Green Chili Enchi-sagna a try and let us know what you think by leaving a comment below. Corn tortillas are layered with a creamy green chili and pork filling and topped with green enchilada sauce for the perfect dinner. 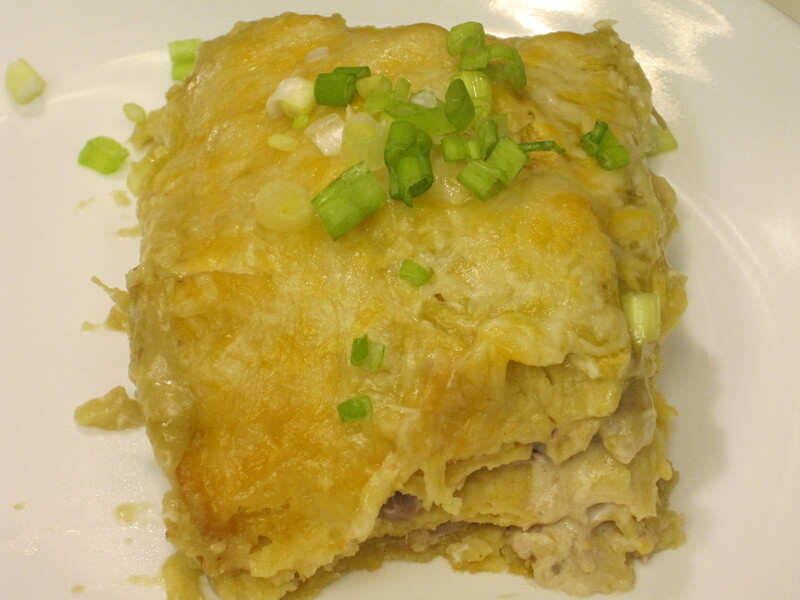 Cook's Note: This recipe can be made with chicken instead of pork if you prefer. 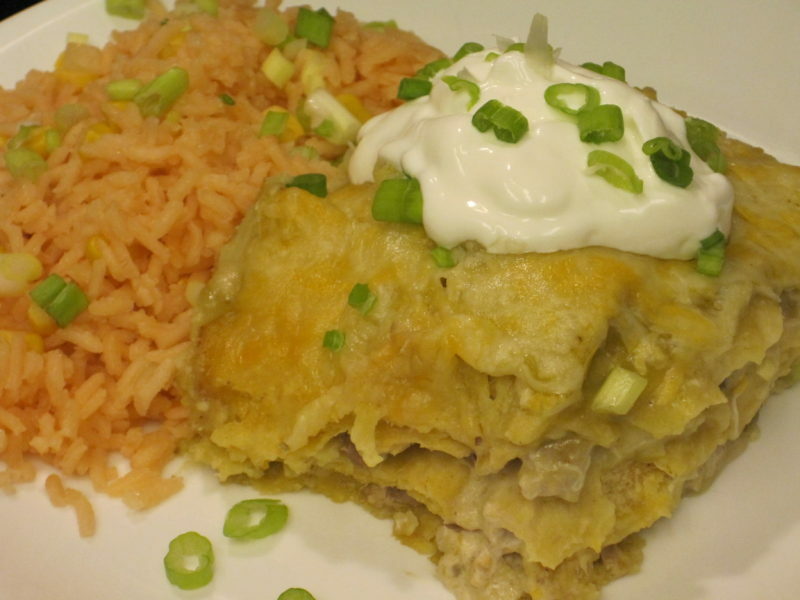 Chicken, like pork, goes well with green enchilada sauce. 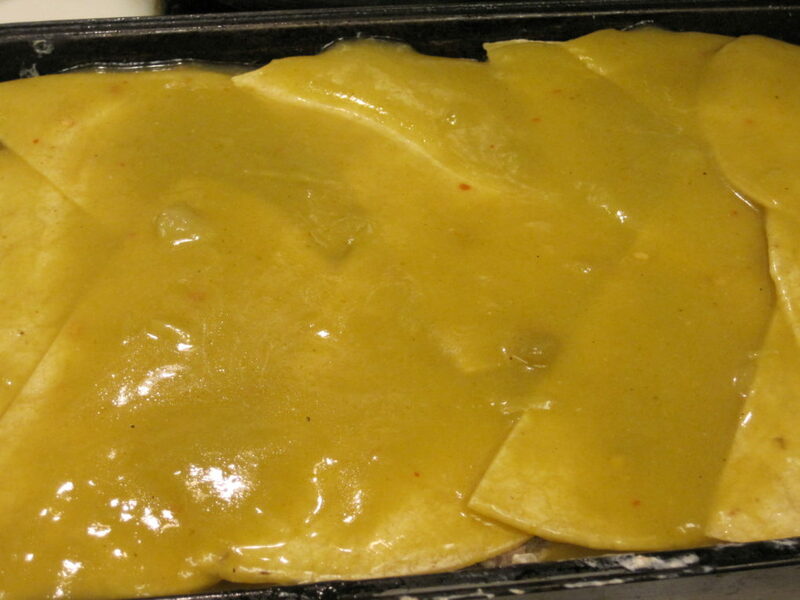 Pour ½ cup green enchilada sauce into the bottom of a 9X13 inch baking pan. Cut tortillas in half and set aside. Arrange 6 tortillas over the bottom of the baking pan, overlapping slightly. You may need to tear one in half to fit into the corners on one end. Cover with another layer of 6 tortillas and 1 cup of enchilada sauce. Layer the remaining pork mixture over the enchilada sauce. Top with another layer of 6 tortillas. Pour the remaining enchilada sauce over the top of the tortillas. 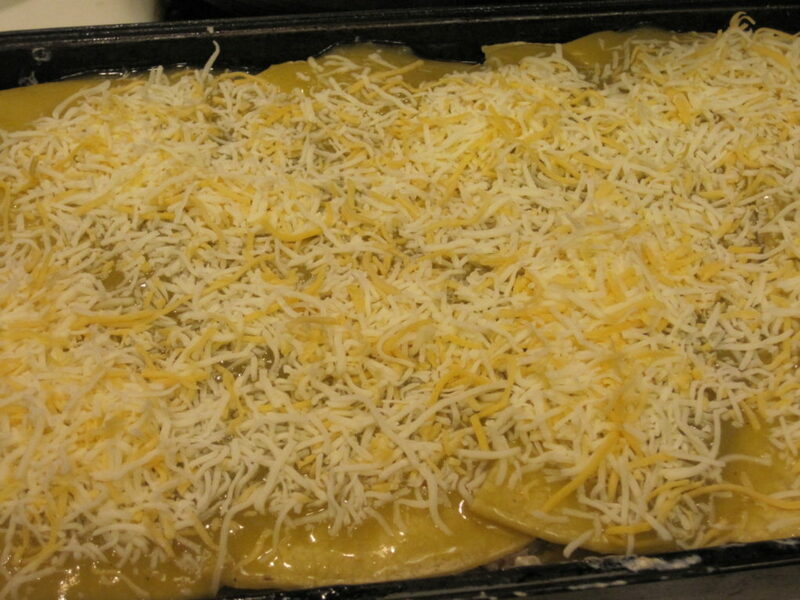 Bake in a 350 degree oven for 20 minutes or until cheese is melted and the Enchi sagna is bubbly. 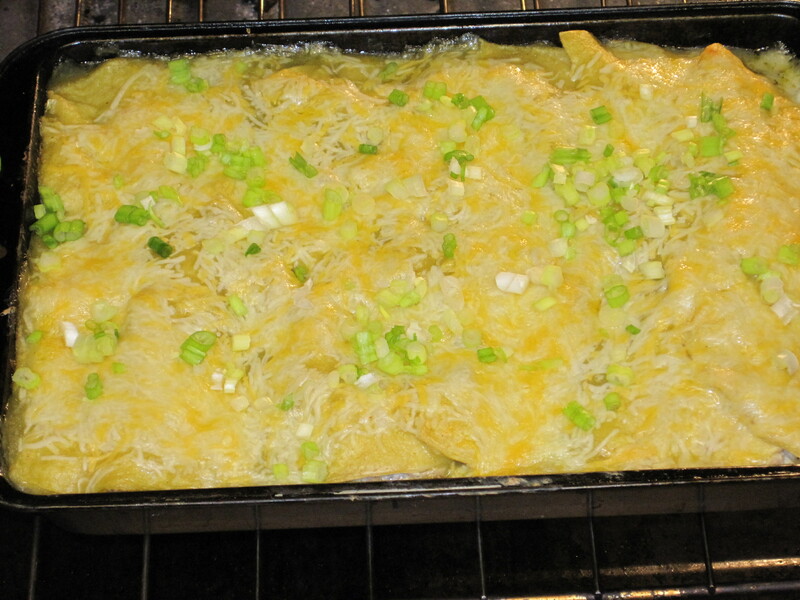 Sprinkle with green onions and return to the oven for an additional 5 minutes. Remove from oven and allow to stand for 5 - 10 minutes before serving. 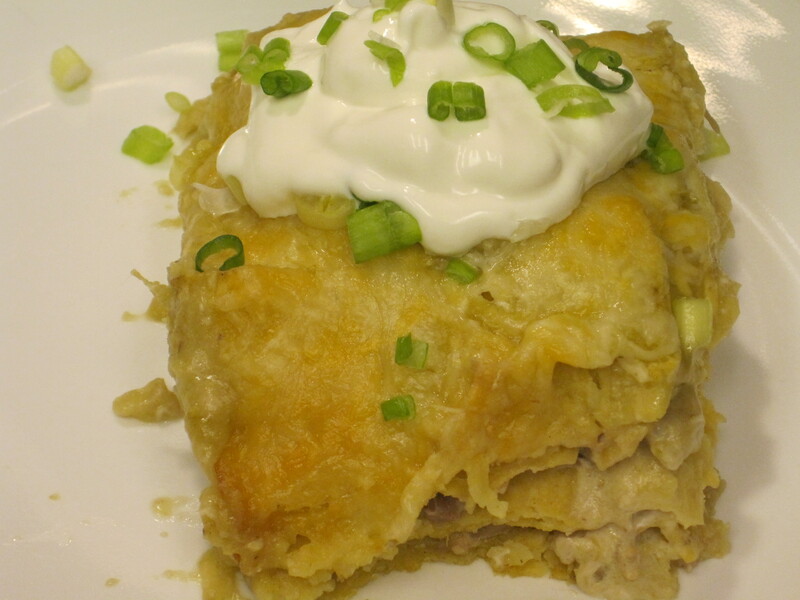 Nutrition Information calculated based upon a serving of Green Chili Enchi-sagna topped with 2 tablespoons sour cream and sliced green onions.